Each year millions of shorebirds make an amazing round-trip journey between the Northern and Southern hemisphere. 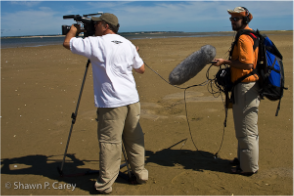 Migration Productions' newest video, "Epic Journeys", looks at three shorebird species—Red Knot, Piping Plover and Semipalmated Sandpiper—and the challenges these species face during each of their monumental annual treks. 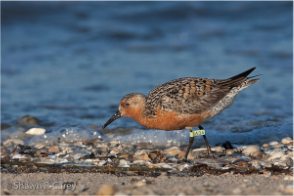 In spring Red Knots travel from south to north, stopping and concentrating by the thousands in the Delaware Bay area in New Jersey where they fuel up on Horseshoe Crab eggs in order to complete their long final flight to the Arctic. 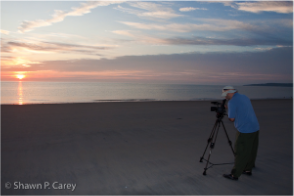 The film examines how the decline in Horseshoe Crab populations has impacted the very survival of this species. 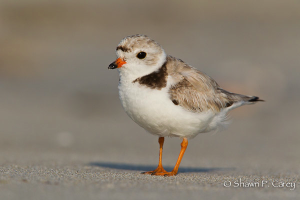 The cute and perky Piping Plover is a species that breeds on beaches in coastal communities in Massachusetts and is currently surviving despite heavy skunk and fox predation and invasions by beach buggies in the 1980's to the point where their breeding numbers fell to record low numbers. "Epic Journeys” shows how improved beach management programs in Massachusetts since 1992 have aided the plover’s numbers to increase and come back in the last 20 years. Finally “Epic Jouneys” features Semipalmated Sandpipers that gather in massive and dramatic numbers in New Brunswick’s Bay of Fundy in Canada before taking wing and flying 3000 thousand miles southward to South America. 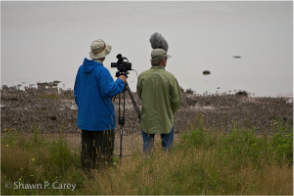 Our film asks burning questions: What is being done to help protect these shorebirds and their habitat? How can the public help with their conservation? And where can one go to best see each of these species en-route to their destinations? Interviews and footage were shot on Plymouth Beach and South Beach in Massachusetts, the Bay of Fundy in Canada, and Cape May, New Jersey. Check our live events calendar to see if there is a screening scheduled near you! Interested in hosting your own screening at a meeting, presentation or festival? Copies of the DVD are available for purchase at the Buteo Books website. Your program is excellent for reasons you stated…the sound truly brings the viewer into the field! Thank you again for an outstanding program. We want you back!